Payne’s Organic Soil Yard can deliver compost, mulches and soils in our dump truck for delivery. Bring your pick-up truck or dump truck and we’ll load you up — or we’ll deliver your mulch and compost to your home for an additional charge. Call us at 424-0336 for a quote on the cost for your delivery. The staff at Payne’s Organic Soil Yard (POSY) includes well-known local mulch and compost expert Sam McCarthy. Sam’s depth of experience and knowledge, combined with top quality soils and mulches, makes POSY the best choice for all your yard and garden needs. 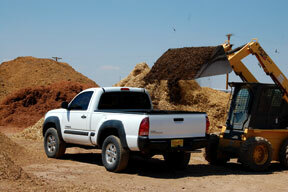 We can quickly and easily load your pick-up truck. 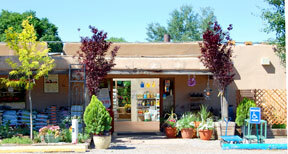 One of the most important secrets to successful gardening in New Mexico is mulch, mulch, mulch. 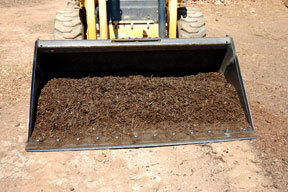 Composts make the best mulches because they improve the soil they cover. Bark mulches are used for decorative reasons or to hold compost mulch in place, but may interfere with nutrient cycling if directly in contact with the soil surface. Composts can also be used as soil amendments. Northern New Mexico soils are very high in some minerals but usually very low in nitrogen, phosphorus, and organic matter. Organic matter is necessary not only for soil moisture retention, but also for maintaining adequate populations of beneficial soil microbes, essential in facilitating plant nutrient uptake. The right compost for your yard depends on the type of soil you have. In addition to the composts ready to load at POSY we can make custom blends to fit your soil needs. You may incorporate Payne’s selection of organic composts into existing garden beds at a ratio of up to 50/50 (depending upon how impoverished your existing soil is). You may then add the organic fertilizers of your choice, or we at POSY can do it for you before you bring your compost home! We can custom-blend organic fertilizers into any of our composts and mulches here at our soil yard for an additional charge. Click here to download a PDF of current prices.